Louis Smith is a world-renowned jazz trumpeter. Smith has played internationally with many famous groups and individuals in the jazz music community, including Miles Davis, Count Basie, and Thad Jones. In 2005, Smith suffered a stroke. After his doctors gave a disheartening prognosis, and advised that he be placed in extended long-term care, his wife Lulu refused to give up and sought intensive therapy for him. Smith worked with many of UMAP’s senior speech-language pathologists, including Dr. Gordon Krainen and immediate efforts were made to rehabilitate Smith. Despite therapy and hard work, Smith still remained significantly communicatively impaired, until the concept of music was introduced into his therapy. “He lit up when music was involved,” Krainen explained. 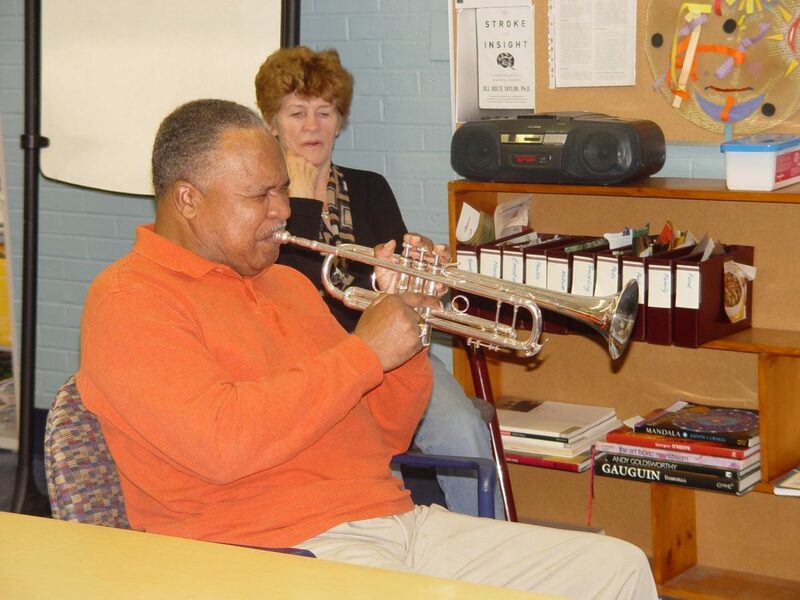 “We worked closely with his music therapist [Lynn Chenoweth] and she worked to support our efforts.” Over time Smith’s confidence grew and despite not having use of his right hand, he eventually picked up his trumpet and learned how to play with his left hand. Chenoweth continues to work with Smith weekly on his music and language skills.